We have reached the state quarterfinals of the Kansas high school football playoffs. Kpreps will continue to post state rankings throughout the playoffs culminating in our final poll after the state champions are crowned. Let’s take a look at the Kpreps.com rankings for November 6th. Check out our complete Rankings for further details. The only change in this week’s Class 6A poll occurs at the bottom where Garden City enters the poll at No. 5 after the Buffs impressive 24-21 road win at Topeka High. Garden City replaces Manhattan at the bottom of the poll after the Indians were eliminated by Derby, 21-14 on Friday. The quarterfinal schedule is highlighted by No. 1 Lawrence Free State hosting No. 3 Derby. The Firebirds and Panthers met in the state semifinals last season with Derby winning 49-21 on their way to the 6A state title a week later. Garden City will travel to No. 4 Wichita Northwest for a second time this season. The Grizzlies defeated the Buffaloes 36-23 earlier this season in a game that Garden City led 23-6 at halftime. In Class 5A, the three top ranked teams rolled into the quarterfinal round with big victories. Top-ranked Goddard blasted Andover 65-7 on Thursday night, while No. 2 St. Thomas Aquinas and No. 3 Bishop Carroll each rolled to victories on Friday night. Maize moves up one spot to No. 4 this week after the Eagles eliminated then No. 4 Wichita Heights, 41-14. Maize will travel to Bishop Carroll this week. The Thunder of St. James Academy re-enter the poll at No. 5 this week after a 19-0 shutout of Shawnee Heights. There are no changes in this week’s Class 4A, Division I poll. Top-ranked Bishop Miege cruised to a 58-6 win over Basehor-Linwood in a rematch of last season’s substate semifinal. Second-ranked Andale crushed Wamego 64-13. De Soto remains in the No. 3 spot after the Wildcats handed Tonganoxie its first loss of the season, 42-7. Maize South scored the final 49 points in a 49-7 victory over Wellington. Finally, No. 5 McPherson edged out the 2016 state runner-up Buhler, 15-14 in overtime, thanks to a successful two-point conversion that featured a reverse and throwback to the quarterback. McPherson will travel to No. 4 Mazie South this week in a rematch of Week 2 when the Mavericks shutout the Bullpups, 9-0. Top-ranked Scott City rallied from a 14-0 deficit to top Kingman, 21-14. The Beavers will travel to Clay Center in the quarterfinals this week. Second ranked Holcomb rolled to a 31-point victory over Colby and will travel to No. 4 Smoky Valley. The Vikings shut down Wichita Collegiate’s offense in an impressive defensive performance that led to a 12-2 victory. Holton enters the poll at No. 5 after a 9-8 victory over Baldwin on Thursday night. The Wildcats will meet Frontenac for the third consecutive season in the state quarterfinals. Nickerson falls out of the poll after being eliminated by Clay Center 21-20 when the Tigers scored the game-winning touchdown with 12 seconds remaining. After being the most consistent top five all season, the Class 3A poll had some major shake-up this week after No. 1 Nemaha Central and No. 3 Conway Springs were eliminated over the weekend. Silver Lake avenged last season’s quarterfinal loss to Nemaha Central by silencing the Thunder, 25-7. Silver Lake will now travel to No. 3 Galena. The Bulldogs used a consistent running game and strong defense to win at Wellsville, 28-6. Phillipsburg takes over the top spot in Class 3A after a 35-6 victory at Hoisington. The Panthers led 7-6 at halftime, but outscored the Cardinals 28-0 in the second half. Marysville is back in the poll at No. 4 after a 36-28 road win at Larned this weekend. The Bulldogs will host Cheney in the quarterfinals. Hesston moves into the poll at No. 5 after upsetting No. 3 Conway Springs 45-42 on a game-winning field goal by Jorge Morales on the final play of the game. Hesston, last season’s state runner-up, will host top-ranked Phillipsburg this week. Plainville reached the Class 2-1A state title game a season ago, falling to Troy 28-24. The Cardinals are back in the top five this week at No. 5 after a 21-0 shutout of Meade. The remaining top four spots stay unchanged in this week’s 2-1A poll. Smith Center put up 84 points in a 77-point win over Medicine Lodge, while No. 2 Jefferson County North pulled away in the second half to defeat Jackson Heights, 36-20. Centralia blasted Doniphan West 63-24 to set up a showdown with No. 4 St. Mary’s Colgan. Colgan dominated then No. 5 Lyndon, 48-6 behind a big first half. Top-ranked Burlingame overcame an injury to star quarterback Dalton Sporing to knock out traditional power Victoria, 34-24. The Bearcats trailed 16-12 at halftime, but scored twice in the third quarter to take a 28-16 lead. Burlingame will travel to undefeated West Elk this week. Second-ranked Spearville won the showdown with St. Francis, 42-20. The Royal Lancers were eliminated by the Indians 36-30 last season in the state semifinals. Spearville will now host No. 5 Central Plains in this week’s quarterfinal. 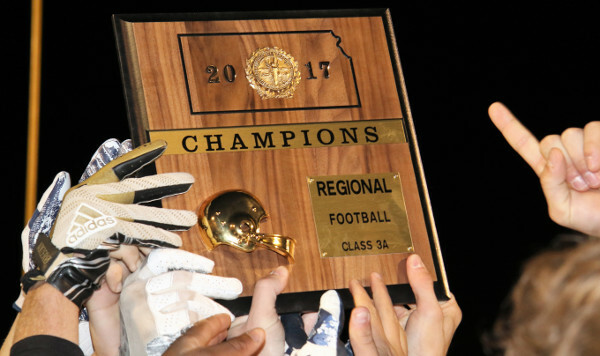 It will mark the fourth consecutive season Spearville and Central Plains will meet in the second-round of the playoffs. Defending champion Osborne remains ranked third after a 64-14 victory over Clifton-Clyde. Hoxie moves up one spot to No. 4 this week after a 50-0 blanking of Ness City. Top-ranked Hanover got a challenge from Mankato-Rock Hills but eventually pulled away for a 64-32 win. The Wildcats led 26-24 at halftime before scoring 26 points in the third quarter to secure the victory. Second-ranked Pike Valley advanced to the quarterfinals with a 62-12 win over Axtell. Pike Valley will host No. 4 Hutchinson Central Christian, a 66-34 winner over Pleasanton in the opening round. Otis-Bison remains in the No. 3 spot this week after digging its way out of a 20-6 hole against Sylvan-Lucas to eventually win 60-26. Finally, Hodgeman County re-enters the top five this week at No. 5. The Longhorns blasted Northern Valley, 59-14 to earn a home game with South Barber in the quarterfinals. Congratulations to the Pawnee Heights Tigers for claiming the 6-Man championship on Saturday at Dodge City with a 62-12 victory over Cheylin. The Tigers built a 21-6 lead after the first quarter and expanded that lead to 40-12 by halftime. Weskan defeated Golden Plains 44-27 in the consolation game to secure a third-place finish.